A short walk to see the greatest site on the Inca Trail! The 2 day Inca Trail is a fantastic option for those who don't have the time or desire to hike the full length of the Inca Trail. With beautiful scenery, a wide variety of flora and fauna on display and a visit to the Inca Trail's most beautiful site (Wiñay Wayna), you get to enjoy the all the best bits of the Inca Trail condensed in to a one day walk. Covering a distance of 16 km / 10 miles the 2 day Inca Trail is not too challenging which makes it perfect for families with children and those on a tight schedule. then your breathe is truly taken away at the Sun gate. Tourists who go into the Machu Picchu sanctuary for a few hours alone really do miss out on this marvelous and mysterious place. A short visit only gives you a stolen glimpse of this impressive empire and does absolutely no justice to this marvelous and mysterious place. It is strongly recommended to book your Inca Trail at least 4 to 6 months in advance as permits can quickly sell out. Starting Altitude - 2100m / 6900ft. Highest Altitude - 2730m / 8,792ft. Accomodation - 3 Star Hotel. Overall Difficulty - Easy to Moderate difficult (depends on your level of fitness). Our trek today takes us along the most impressive stretch of the Inca Trail. We'll visit beautiful Inca sites , see a variety of flora and fauna and get to take in the fantastic panoramas of the Andes mountains. Covering 16km of the trail our journey begins in the Sacred Valley and works it's way up along an original Inca Trail to the Inca site of Winay Wayna before continuing on to Machu Picchu via the Sun Gate (Inti Punku). As we make our way to Machu Picchu we'll pass through the lush and verdant cloud forest that covers the mountain and get to see a variety of plants, flowers and birds along the way. We may also see some larger mammals such as Viscachas (rabbit-like Chinchillas) and Spectacled Bears (if we are very lucky). After a full days trekking we'll arrive to the Sun Gate (Inti Punku) in the late afternoon and get our first views of Machu Picchu spread out on the mountain below. The light at this time of day is great for photos and with fewer tourists in the site it's a perfect time to take some pictures of the site. After we've passed through the Sun Gate we'll carry on along the trail a little way before taking a side trail that leads us to Aguas Calientes in the valley below where we'll check in to our hotel. Waking up early (04:00am) we'll take one of the first buses back up to Machu Picchu to enter the site as soon as it opens (06:00am) We'll have a 2 hour guided tour of the site during which you'll learn about the Incas and visit all the most important areas of the citadel. After your tour you'll have free time to explore the site by yourself and if you have permits to climb either Huayna Picchu (2 hours round trip) or Machu Picchu mountain (3 hours round trip). In the afternoon you will take the train back to Ollantaytambo (2 hours) from where you will carry on by bus back to Cusco (2 more hours). 1 Breakfast, 1 Boxed Lunch, 1 Dinner. If you have a dietary request such as vegetarian food please let us know. 3 Star Hotel (La Cabaña, Waman, Santuario or similar). Entrance to the Inca Trail and Machu Picchu ruins. 2 Bus tickets for the second day (Aguas Calientes -Machu Picchu - Aguas Caliente). 2 days 1 night Inca Trail Prices 2018 in USD American dollars. 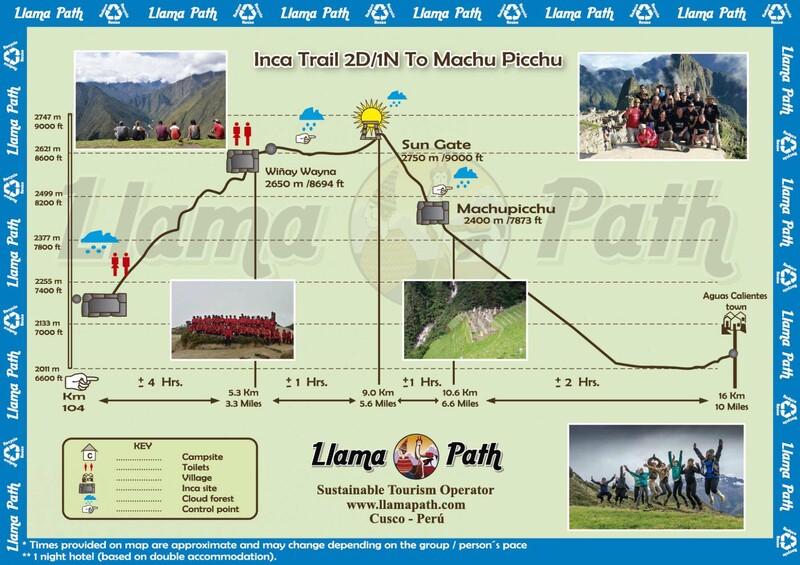 IMPORTANT: The 2 day Inca trail Prices Depend on the final number of people in your group. If there is a cancellation please note, the price per person will reflect the actual number of people going on the trek. Please NOTE, you MUST be aware at this point that it could just be 2 in the group ( in order to make sure you will be part of a bigger group please email us to double check our already existing groups and the number of people in each of them). Important: On your request we can book this trip as a Private Service. Maximum Group size for the 2 day 1 night Inca Trail: 16 people with 2 Guides. Students with a valid UNIVERSITY Student card (You must be No older than 25 YO) can have a $20 discount(please scan and email the card). Children 7 or younger can have a $40 discount ((please scan and email passports). Note: Important for Univeristy/Child Discount - without your Student/Passport copies we cannot process your booking with the discount and we will book your places at the full adult rate. daypack (water, camera, sunscreen, raingear, etc.). The Box lunch should weigh a little less than 1 Kilo. responding to emails and the possibility of missinga booking for even your alternative date). change your passport before you do the Inca trail). There is an $8 fee for changing your passport number. Please send a scanned copy of your new passport as soon as you have it. need to take the original on the Inca Trail. conditions that we should know about. writing YES within brackets ( ). regard to departure date etc). if you get the permits for the 7am start you will probably have to miss the Machu Picchu guided tour. g, Confirm room type. Our prices are based on a shared room so please indicate if you would like a double or twin. (A triple can be organized if numbers are applicable). There is a single supplement of $40 if you would like a single room. this may go to Ollantaytambo / Poroy depending on availability and you will return to Cusco from there by bus. $385 per person for Inca Trail + Wayna Picchu. you will have anydelays on arrival). NO transaction Fees from January 2nd, 2017!! Please Note Local Payment (payment of Balance) will be paid upon your arrival in Cusco in cash and in US Dollars. Go to the homepage on our website (www.llamapath.com), click on ‘payment options’. Select VISA. Fill up the form with the requested details of your card and write the amount you want to send in the box (avoid using symbols like $ or additional letter like USD). Important: No need to fill in the 'Purchase Number' part. At the end of the transaction, you will have a screen with a confirmation receipt. Please search into it and email us confirming deposit and the order number. If you have any queries or require further information, please do not hesitate to contact us.